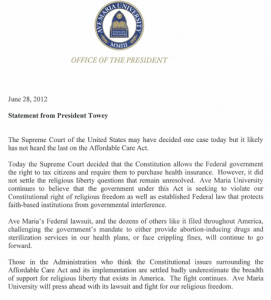 The discussion is still swirling, but the Supreme Court has ruled that Obamacare is constitutional. It is not allowed under the commerce clause, but is viewed as a tax. This is a disaster for our country. 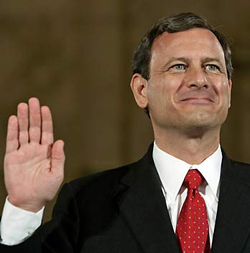 Chief Justice John Roberts is the one who tipped the scales for Obama. This will be how he is remembered in history. Now we have to move against this indignity and insult to our freedoms. Let’s get a new president with conservatives in Congress to cut it out by the roots. Many are discouraged and furious. What the court has done is done. What do we do now? Two things: 1) Use it to our advantage this Fall by rallying all those opposed to Obamacare (the majority of Americans) to get out and vote for a new president; 2) Continue to push the religious freedom angle which still has great weight and constitutional implications.